Davis Technologies Profiler Wheel Speed Management System provides unprecedented control of wheel speed to give all classes of drag racers improved E.T. and consistency. Profiler samples at an extremely high rate of 1,000 times per second and has incredible accuracy to one RPM. 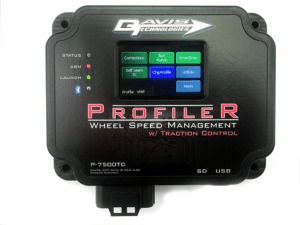 Profiler can also include other great Davis products like Self Learning Traction Control, Bump Box, Pro Axe and Event Timers to control other systems in the car, such as Shifters, Fuel Solenoids, Lock-Ups, Converter Bleeds, etc. Special versions available for Holley EFI & FuelTech to allow for full control with coil packs or COP. 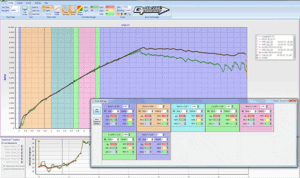 Using intuitive software to easily setup a desired drive shaft curve, and adjust corrections above or below the curve, to retard or advance timing make Profiler the absolute best Wheel Speed Management available. The patented software gives the tuner unprecedented control of the power delivered to the drive wheels. Nick Agostino Great job Mike....we have used the profiler for years with great success also and in this game you need to stay on top of technology or it will leave you behind in a split second. Tools like this not only help you get down the track but also help you really understand the car and helps in decision making on the tune up. Glad to see you back on track Mike. David Comstock That one pass when you make it to the finals and blow the tires off, DEEP down inside Shannon Davis and The Profiler cross your mind!!!! Korey Peters Best product hands down. I've tried 3-different TC 's and there is no comparison. Thanks Shannon Davis for a great product and Andre Davis for his tuning skills. Congratulations Mike Murillo well deserved buddy. Patrick Barnhill- Thanks Shannon Davis for making a great product......the Profiler rocks! It has helped us figure out Lou’s Vette and make it one of the fastest cars in Outlaw 10.5.